Michael Novogratz, a former fund manager at Fortress Investment Group, is today a venture capitalist and the founder and CEO of Galaxy Digital. Novogratz announced plans in 2017 to launch a cryptocurrency hedge fund on December 15, but on December 13, the day when bitcoin hit a then-record-high price of $16,700, he told investors that the investment climate was too risky and declined to proceed with the fund. Forbes recognized Novogratz as a billionaire in 2007 and named him to its Richest People In Cryptocurrency list in February 2018. Also in 2018 Novogratz and his interest in bitcoin were profiled in a full-length New Yorker magazine article titled "A Sidelined Wall Street Legend Bets on Bitcoin." In January 2019, Novogratz acquired 7.5 million shares of the TSX Venture Exchange for C$7.42 million. This caused him to increase his stake from 76.6% to 79.3% of the company. Novogratz said in an interview with Bloomberg TV in February 2019 that despite the significant downturn of the crypto markets from 2018 into 2019, the amount of attention the space had been getting by institutional investors and market makers would eventually cause a rally by 2020. Novogratz was employed by Goldman Sachs in 1989. Goldman transferred him to Tokyo and then Hong Kong, where he became the head of the bond trading desk. He became a partner in Goldman in 1998 and in December 1999 he became president of their Latin American operations based in Sao Paulo, Brazil. The next year Novogratz left Goldman due to his admitted "partying like a rock star." By 2002, Novogratz had joined Fortress Investments and was managing a macro-strategy hedge fund. Fortress was successful and when it went public in 2007, Novogratz reaped shares worth $2.3 billion. He left Fortress in October 2015 after major losses in his macro hedge fund that were tied first to the Swiss franc and then to positions tied to Brazilian interest rates. Novogratz is a 1987 graduate of Princeton University. ↑ A ‘master of the universe’ will wrestle with Pier 40 and park. The Village. ↑ About Us. Galaxy Digital. ↑ Why Michael Novogratz Halted His Bitcoin Hedge Fund. Wall Street Journal. ↑ A Sidelined Wall Street Legend Bets on Bitcoin. The New Yorker. ↑ Novogratz Increases Stake in Galaxy in Wake of Meltdown. Bloomberg. 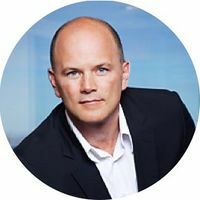 ↑ Crypto Finally Poised to Get Institutional Money, Novogratz Says. Bloomberg. ↑ Brazil walloped Fortress fund, forced out Novogratz: WSJ. CNBC.